Recently I’ve been listening to a fair amount of what some might call “middle of the road” pop – thanks to my local public libraries. In so doing, I’ve come across some surprises in the mainstream: some unexpected songs nestled among the familiar and the safe. 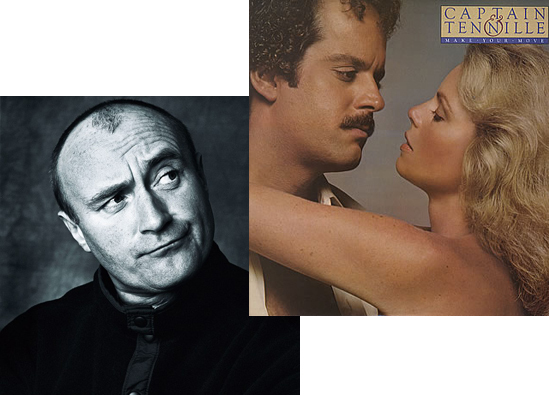 Two in particular – “Happy Together (A Fantasy)” by Captain & Tennille and “Wake Up Call” by Phil Collins. Let’s talk about the Captain and Captainette’s track first because it’s just so weird. A cover of the Turtles’ 1967 hit “Happy Together”, it appeared fairly late in the husband and wife duo’s career on their 1979 album Make Your Move (is it just me or does the Captain usually look like he’d rather be anywhere else than at his album cover photo shoots?). I can only guess they added “A Fantasy” to the title meaning they’re attempting a sort of fantasia – a mixture of different musical styles, some fantastic dramatic creation. But what the hell is going on here? In an unexpected move, their version totally subverts the sunshiny, bubblegum pop of the original, starting off with faux-opera male and female vocals echoed by synth, and a steady if somewhat dull thump-thump drum backing before it launches into a sultry Toni Tennille delivering the verses. Before we know it, the song becomes a big pop tune, while it also flirts with morphing into a showtune. Along with the way we hear odd faux-opera backing vocals again. Then we have strange fluttering percussion like a bird trapped in a box, but which is probably supposed to be galloping horses around 2:25. Then a cheesy synth comes in, sounding like something they picked up at the local toy store. Wait, here come the horses again! For some reason, a vaguely Indian riff on a fake sitar (the Captain has pressed the “sitar” button on his new toy store keyboard) and some “exotic” chanting/singing ensues, along with a tabla (real?). Eventually it all comes rushing back to the big pop chorus: picture a glitzy stage, disco balls and hundreds of backing dancers, confetti falling. It’s all a big most-definitely-not-easy-listening mess, actually. And this was on the same album as the oh-so-smooth and syrupy adult contemporary “Do That To Me One More Time”. Their version of “Happy Together” seems to have been an anomaly in their career. And that’s just as well, because I can’t really say experimentation was their forte. 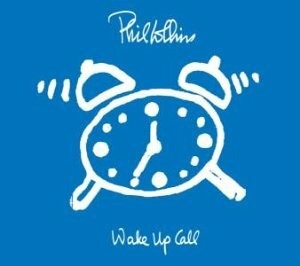 Now, Phil’s track – well, that’s a nice surprise. I’m not one of those people who hate Collins and the love ballad type of music he’s come to stand for, nor do I blame him for making Genesis “uncool”. I love long-haired and bearded Phil era prog-rock Genesis, but let’s face it, if they had stuck to that style of music they’d be naught more than a fondly remembered band from days gone (long) past. Prog-rock was not popular in the 80s and due to Collin’s pop writing prowess, he kept them on the radar. And there ain’t nothing wrong with a well-executed pop song. But, by the 90s even I had grown a bit tired of Collins’ output, solo and otherwise. It had become a bit formulaic and tepid. However, on 2002’s Testify, an album I totally missed when it was released, the lead track is a fresh spark called “Wake Up Call”. But still, both songs just go to show you to always expect the unexpected.